Woo! Egg oiling party! Woo! Wait - what? Yup, it's that time of year again, when we all get together and re-oil the eggs. The Antarctic treaty prevents us from keeping any sort of livestock, and we're completely cut off (physically) from the outside world through the winter. 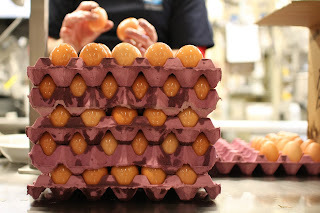 Eggs - important not only for breakfast, but also for most of the baking done here - will ordinarily only last a couple of months, but if you keep them well oiled, the oil will seal the shells and keep them from going off until fresh supplies come in November. They were all oiled at the start of the season, and last night it was time to freshen up their coatings. About half the station crowded into the kitchen, poured themselves bowl after bowl of canola oil, and started dipping, rolling, and massaging eggs. 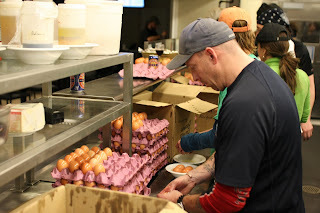 There were the predictable casualties (beer, very oily hands, and thousands of eggs were never meant to go together), but within an hour we'd unpacked, oiled, and repacked more eggs than most people see in a lifetime. It's funny the stuff nobody tells you about until you get here. Oily eggs? I wonder how they figured this out? Are they all brown because of the oil, or?